The Real Smell of Leather! Can be hung from the Rear View Mirror or put under your seat or on the steering column etc to be more discrete if required. The distinct smell of traditional English leather is rarely found today, modern tanning processes do not have that luxurious evocative smell, a smell that nearly everyone craves and expects. When you come into contact with leather you instinctively smell it, you expect it to have that unmistakable leather smell, and it never does, it’s one of the biggest disappointments in owning a modern car. It’s because of modern tanning processes that the distinctive smell is lost. 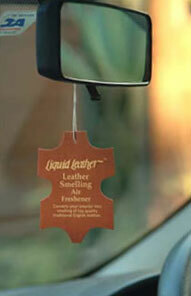 Place this 'Liquid Leather' air freshener in your car and enjoy the smell of real leather as it used to be! Shipping prices vary by weight, size and destination of the goods ordered. To see how much shipping will cost for your order please add the relevant parts to your shopping cart. On the shopping cart page you will see a 'shipping quote' box, simply select your country and/or add your postcode and you will be able to see the shipping options and prices that are available to you. International International delivery prices are calculated individually for each order. Add your items to the shopping cart to get a quote.